These two items appeared separately in the original version of the Around Naples Encyclopedia on the dates indicated and have been consolidated onto a single page here. For those who are not claustrophobic—nay, for those who absolutely revel in their agoraphobia—I recommend a visit to the Roman aqueduct system that supplied Naples. It is one of the most impressive feats of engineering undertaken in Naples during the reign of Caesar Augustus. The aqueduct was 170 km long and started at a reservoir fed by the river Serino (see map in item #2, below). There were two branches: one led to Beneventum and the other to Neapolis. The one to Naples approached the city from the slopes of Capodimonte, then went on to Vomero and to Posillipo, the hill bounding the western end of the city. From Posillipo, a secondary branch lead through the hill and to Fuorigrotta and beyond, to Puteoli, modern day Pozzuoli. Parts of the aqueduct were open and others were tunnels through the rock. That Posillipo aqueduct runs parallel to the Roman tunnel known as the Seiano Grotto and was apparently built at the same time as the tunnel, itself. The tunnel is occasionally open for visits. As far as I know, the aqueduct is not; I know of its existence only because I was led into it by a crazy archaeologist friend of mine. It was there that I found out that I don't particularly like to be cooped up in tight spaces beneath mountains. There, now that I have your attention, this is about aqueducts. Very early: Naples is a very old and continuously inhabited center of large population and, as such, has always required a generous supply of fresh water. The earliest documented conduit to supply the ancient city is the so-called Bolla aqueduct. An 1889 study entitled Topography of the deep water network of canals, contributing to the study of the subsoil of Naples by Gugliermo Melisurgo, claims, however, that "… there remains some mystery as to its origins". It may have been Roman or, even earlier—Greek. So, briefly, we don't know. If there were Etruscan or even Samnite aqueducts in the area, we don't know that, either. Suffice it to say that the Bolla was an important aqueduct in the ancient city and, in spite of being superseded by later ones, remained important, seeing service as late as 1947 (!). The Romans: It is not evident from looking at the western end of the Gulf of Naples—that is, the Bay of Pozzuoli—that this is where the "beautiful people" lived at the time of Augustus Caesar. After all, who wants a house in downtown Naples if you have the money to move out near the mythological roots of the whole gulf, where Ulysses and Aeneas trod, an area replete with splendid thermal springs and offshore islands. At the same time, the area contained Puteoli (Pozzuoli), an important commercial port; also, nearby Cape Miseno sheltered one of the best natural harbors on the west coast of Italy, a perfect place for an imperial fleet. the Avello aqueduct for Pompeii (dotted green line). The Roman aqueduct to supply the idle rich, the merchants and the imperial sailors with water was extensive and, indeed, an impressive feat of engineering. The Romans brought water into the area via the Aqua Augusta, historically referred to as the Serino aqueduct. The source was in the Terminio-Tuoro mountains and was named the Fons Augusteus, now known as Acquaro-Pelosi, near the town of Santa Lucia di Serino, due east of Naples, not far from Avellino. Along its 100 km length to service Miseno, the aqueduct also passed by Pompeii, Herculaneum and Naples, with numerous branches from the main aqueduct running in to provide water to the public and private fountains and cisterns in those communities. In Naples, the Serino line passed through a tunnel now known as the "Crypta Napoletana," one of the Roman tunnels that passed beneath the Posillipo hill to lead to the Campi Flegrei, the town of Puteoli and then the target at Miseno, the largest freshwater cistern ever built by the Romans, the Piscina Mirabilis (photo, right). The cistern was dug entirely out of the tuff cliff face and was 15 meters high/deep (ca. 45 feet), 72 meters long (ca. 220 feet), and 25 meters wide (ca.75 feet). The capacity/volume was 12,000 cubic meters (ca. 36,000 cubic feet). It was supported by vaulted ceilings and 48 pillars. 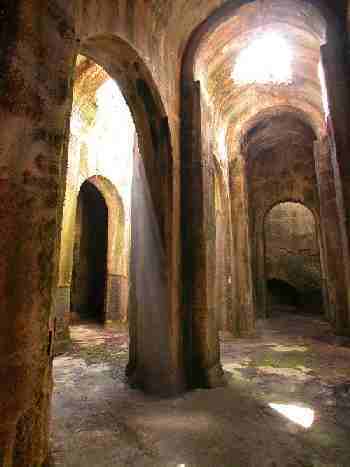 Adjacent to the main cistern at Miseno were a number of other private cisterns such as the one now called the Cento Camarelle— the One Hundred Little Rooms— a group of cisterns arranged on two levels, possibly the property of the orator Quintus Hortensius Ortalus. Modern Times: The ancient aqueducts served the city and surrounding area until the Spanish vicerealm, when the Carmignano aqueduct was finished in 1629. It was named for Cesare Carmingnano, a nobleman who engineered the feat. It seems to have incorporated a preexisting conduit that sources say "may have been Roman." After the unification of Italy and in the wake of severe hygienic problems in Naples, including outbreaks of cholera, the decision was made to build a new aqueduct. It was built between 1881-1885 and was a vital part of the "Risanamento" — the massive urban renewal of the city between 1880 and 1915. The agency that administers the modern Naples aqueduct is called ARIN, an acronym for Azienda risorse idriche Napoli (Agency for Water Resources, Naples). The aqueduct is named the Serino, the same name as the ancient Roman one. There are actually two groups of headwaters in the area that are utilized by ARIN: the Acquaro-Pelosi at 380 meters above sea level and the Urciuoli at 330 m. The ARIN facility that collects the water and starts it on its journey is set on about 50 acres. From the 60 meter long Serino canal that brought the water out from the source, the aqueduct then included more than 20 bridges along the route to Naples, the longest of which was 1800 meters. The aqueduct then ran through a large distribution point in Cancello di Caserta and made a 22 km run into the two large municipal cisterns, one at Capodimonte (capacity: 82,000 cubic meters) and the other at Scudillo (capacity: originally 20,000 m3, then increased to 145,000 m3). The 1885 finished aqueduct was meant to serve the needs of the population of the city at that time—about 500,000. With the 1936 expansion, the current capacity permitted a flow of as high as 2350 liters per second (between 500-600 gallons). 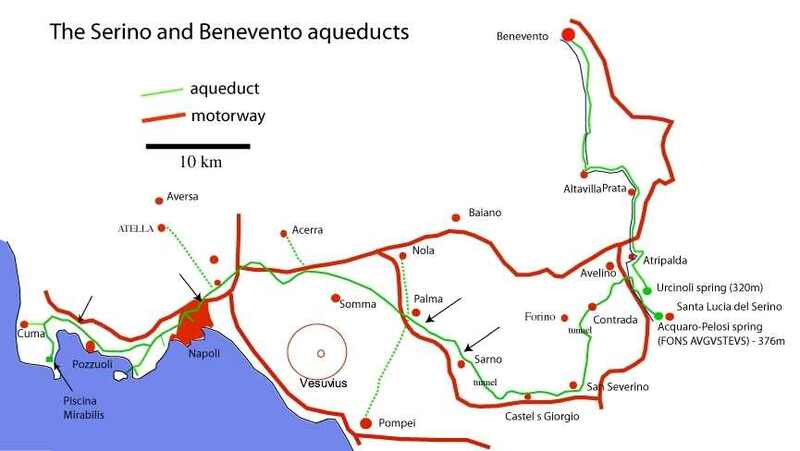 Today, the aqueduct systems have been upgraded to supply the increasing needs of the city and the northeastern part of the Campania region. There are now four main lines that supply water from sources in Lazio, Molise and Campania. Besides the 1885 aqueduct, there now exist the Campania aqueduct (1958), the Western Campania aqueduct (1998) and the Lufrano Aqueduct (ongoing upgrade). Of historic interest is the post-WW2 resurrection of the ancient Roman Bolla aqueduct to help supply the city during the drought of 1946-7. Interestingly, the 1967 work cited below contains this: "...[supply]...will increase with the completion of the Campano aqueduct to about 350 liters per person per day...for a population of 1,425,000, predicted by the year 2000...the calculations run through to the year 2020 and aim at a sufficient water supply for the predicted population of 1,650,000." That is way off; the current (2010) population of Naples is only about 1,000,000). —The website of ARIN, the Naples Water Management Board.